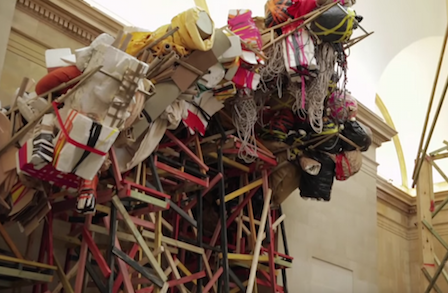 Sculptor Phyllida Barlow unveils her largest and most ambitious work to date. For over four decades Phyllida Barlow has made imposing, large-scale sculptural installations using inexpensive, everyday materials such as cardboard, fabric, timber, polystyrene, plaster, scrim and cement. She now takes on the challenge of the Tate Britain Commission 2014. This annual commission, supported by Sotheby's, invites artists to make work in response to Tate's collection of British and international art and to the grand spaces of the Duveen Galleries at the heart of Tate Britain.